One of the most anticipated careers in the history of the NHL, Eric Lindros made his debut with the Philadelphia Flyers in 1992-93, registering 75 points in just 61 games. 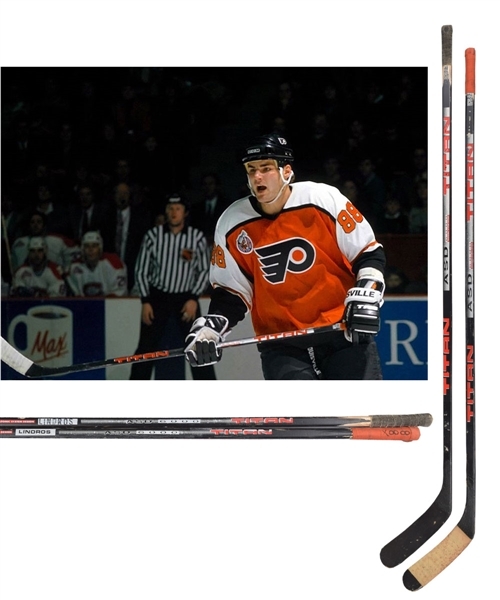 We have a pair of sticks used by Lindros during his rookie season with the Broad Street Bullies. 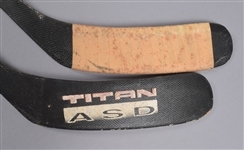 Titan ASD Graphite 6000 models, “Lindros” factory graphics are visible on one stick, with the other example similarly stamped. Both retain their original cloth wraps over the shaved handles/knobs, with red cloth tape on one including handwritten “88” – with white tape over the blade – while the other has black cloth wrap over the handle and the blade tape removed. 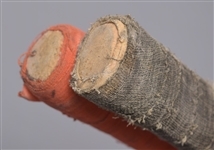 Both sticks exhibit moderate to heavier use, with wear to the blades and shafts, with the tapeless blade cracked along the underside. There is also some spotting over the taped blade example. A signed LOA from Eric Lindros will accompany. It should also be noted that residue is present in a few spots from tape removal, as both sticks were at one time bundled and taped together.